Partie Septentrionale du Cercle de Haute Saxe qui contient le Duche de Pomeranie et le Marquisat de Brandebourg. 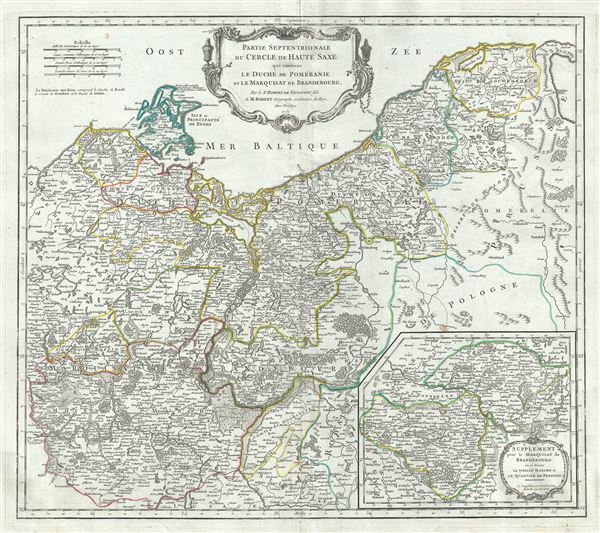 This is a beautiful map of the northern portion of Upper Saxony, in what is now Northeast Germany and Northwest Poland, by Robert de Vaugondy. In includes the Duchy of Pomerania and Brandenburg and extends from Sulechow to Leba in Poland and west as far as Rostock in Germany. An inset in the lower right quadrant features a supplement for the Marquisate of Brandenburg. The entire region is depicted in extraordinary detailed, offering both topographical and political information, with forests and mountains beautifully rendered in profile. The 'circles' of Germany are the 'imperial circles,' administrative units created for tax and defense purposes by the Holy Roman Empire, of which these areas were a part. The Napoleonic Wars would, of course, dissolve the Holy Roman Empire and lead to the consolidation of Germany in 1871. In 1180 Duke Henry the Lion fell, and the medieval Duchy of Saxony dissolved. The Saxe-Wittenberg lands were passed among dynasties who took the tribal name Sachsen (Saxons) upstream as they conquered the lands of the Polabian Slavs further up the Elbe. The Polabian Slavs had migrated to this area of Germany in the second half of the first millennium A.D., and had been largely assimilated by the Holy Roman Empire by the time this map was made. Today, the German government recognizes some 60,000 'Sorbs,' or descendants of the Polabian Slavs, who have retained their language and culture. A large decorative title cartouche appears near the top center of the map. Issued in the 1757 issue of the Atlas Universal. The Atlas Universal was one of the first atlases based upon actual surveys. Therefore, this map is highly accurate (for the period) and has most contemporary town names correct, though historic names are, in many cases, incorrect or omitted. Very good. Minor wear along original centerfold. Original platemark visible. Some spotting and offsetting with water stains near borders. Rumsey 3353.061. Pedley, Mary Sponberg Belle et Utile: The Work of the Robert de Vaugondy Family of Mapmakers, 264.